Going into 2011, Rockstar Energy Suzuki’s Ryan Dungey was the man to beat. He’d wrapped up the 450SX Championship in his first5 year on big bikes and absolutely dominated the 450 Class outdoors. If there was going to be any opposition, the class was either going to need some new blood or an existing racer would have to step his game up. As it turned out, threats to Dungey’s reign would come from multiple directions. First, there was Monster Energy Kawasaki’s Ryan Villopoto. He’d missed almost all of 2009 with a knee injury and was also absent in 2010 after a horrific crash near the end supercross. Needless to say, his presence was highly anticipated, and the fans were excited to see him finally battle Dungey for the first time at the Nationals on a 450. Adding to that excitement was the return 2009 450 Motocross Champion Chad Reed, who’d exited the 2010 season early due to the Epstein-Barr virus. That was all behind Reed, who’d formed his own team, TwoTwo Motorsports, and he was ready to shut down the whispers that his best years were behind him. And James Stewart also came in fresh, rested, and ready to reassert himself as a championship threat in supercross after missing most of 2010 with injury. With so much talent on the line, it was anyone’s guess who would win on any given night in Monster Energy AMA Supercross. Whenever it seemed like one racer had some momentum going, something would happen to re-level the playing field. Dungey had a chain come off during the main event at Anaheim 2, and when Villopoto started to stretch out a points lead a little over halfway through, he shockingly failed to qualify in Jacksonville—but then Stewart was unable to capitalize when he crashed out of the main that same night! Stewart put on a charge near the end of the season, but a crash in Salt Lake City put the nail in the coffin of what was already a somewhat inconsistent season. Reed was the only rider who was able to avoid major catastrophe, and his consistent results had him in the title hunt until the final round, although it could be argued that the championship was decided in Salt Lake City one week before the actual finale. Villopoto led Reed by just two points, and the addition of even two more would have a major bearing on the title. 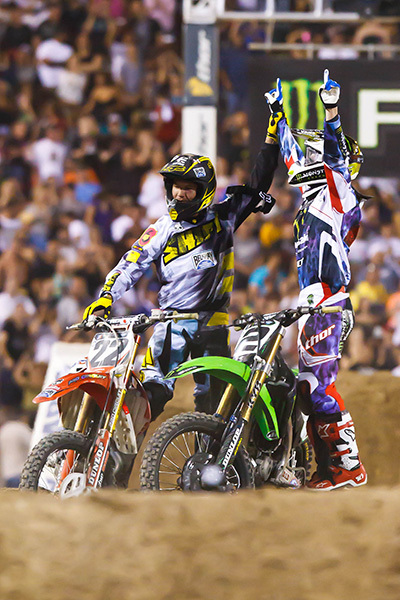 The two staged a spectacular battle in SLC, with Villopoto edging Reed by less than a second to take a five-point lead, which he put to work to formally seal the deal at the final round in Las Vegas the following week. … only neither of them won. Red Bull KTM’s Ken Roczen took the win that night (his first in America), and a huge battle involving Tomac, Cole Seely, Kyle Cunningham, and Tickle erupted, with positions rapidly changing back and forth. Tickle eventually took second while Tomac dropped to fourth, handing the title over to Tickle. In the East Region it was initially a fight between Justin Barcia, Dean Wilson, and Blake Baggett, with each taking a win in the first three rounds. In fact, at that point GEICO Honda’s Barcia had 69 points, Baggett 65, and Wilson 60. But Wilson and Baggett would have their problems—Wilson faltered slightly in Daytona and Indianapolis, and Baggett failed to qualify in Jacksonville. Star Racing Yamaha’s Ryan Sipes threated to join the championship fray with solid finishes and his first career win in Indianapolis but wasn’t quite on Barcia’s level; a seventeenth-place finish in Dallas dealt major damage to his season. The same bad luck didn’t touch Barcia, whose worst finish of the season was a second, and he went on to win the title. In motocross, the battle for the 450 crown picked right back up where it left off in supercross when Reed took the overall victory at the series-opening Hangtown Motocross Classic. Dungey would attempt to rebound the following week at the Freestone National in Texas, but intense heat caused his fuel to boil in the second moto, which resulted in him running out of gas while leading. Reed would go on to win two of the next four overalls, and with the points lead in hand, his bid for a championship was looking healthy. That all changed at the Spring Creek National in Minnesota. After winning the first moto, Reed had a huge get-off over a big tabletop (now named “The Chadapult”) in the second. He was completely ejected from his bike and hung in the air for what seemed like decades before crashing back down to earth. (Google it—it’s amazing.) Somehow, Reed escaped without any broken bones and rejoined the race. The damage had been done, however, and although he left Spring Creek still leading the points, he wasn’t able to regain his championship form. 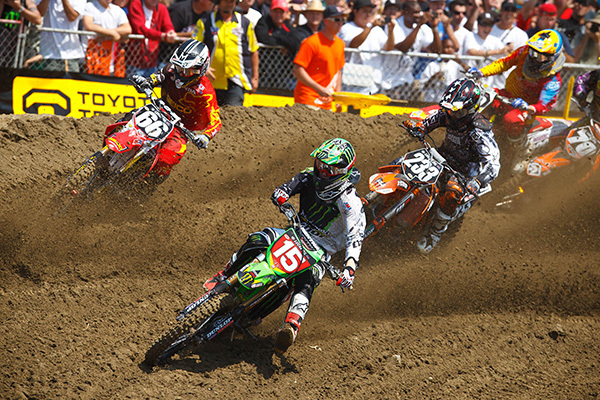 All eyes were now focused on the Ryans, who traded overalls at Washougal and Unadilla. Then, at the Southwick Moto-X 338 National, it was Brett Metcalfe who was victorious one year after running out of fuel on his way to the win on the very same track. As for Dungey, he won the first moto but fate dealt him another nasty blow in the second when his bike wouldn’t start, forcing him to finally get underway almost an entire lap down. Villopoto won the next round at Steel City, extending his lead to 14 points, and with only one round left, Dungey would need a big break to win the title—which he nearly got at the season finale at Pala Raceway. A first-turn crash in moto one caused both Ryans to get horrible starts, and both began slicing through the pack. In his haste, Villopoto landed so hard off a jump that his right hand came off the bars, nearly causing the crash Dungey needed to get back in contention. Villopoto held it together, though, and although Dungey would take the overall that day it was Villopoto who won the war of 2011. As for those Pro Circuit guys, early on it looked as though the title would come down to either Blake Baggett or Tyla Rattray. Between the two of them, they won the first eight rounds, and Baggett was showing incredible speed late in the motos that his competitors simply couldn’t match. It was those late charges in 2011 that would earn him the nickname El Chupacabra. It turned out to be Dean Wilson who found himself in the championship lead after round five at Thunder Valley. The young Scotsman (by way of Canada) had yet to win an overall, but he was consistently in the top three, and at round nine—when he finally went 1-1 at Unadilla for his first win of the season—he found himself with a sizable championship lead, thanks to a DNF from Rattray in the second moto. Rattray would come back for one more victory at Moto-X 338 at the next round, but Wilson retaliated by dominating the final four motos of the year to become the 250 National Champion.